WASHINGTON — Honeywell is developing an augmented and virtual reality windshield to enhance situational awareness in future ground vehicles for the Defense Advanced Research Projects Agency. The company is testing a wrap-around windshield that provides contextual awareness through lower-resolution images combined with a binocular eye display that provides more precise images as part of DARPA’s Ground X-Vehicle Technologies program, Doug Harris, Honeywell’s advanced technology manager in crew interface systems, told Defense News. Honeywell is taking its “near-to-eye” and display technologies developed through military and commercial avionics flight decks, such as for the Boeing 777 commercial airliner, and applying them toward the DARPA vehicle program. The company has designed a wide-angle, high definition view of the outside, “potentially allowing the operator to track optimal routes over difficult terrain, review infrared and terrain classification views, and see allies and adversaries,” according to a company statement. The DARPA program as a whole is exploring new vehicle technologies to shift the paradigm between survivability, agility and mobility for a next-generation of military vehicles. The struggle now in vehicle development is designing a vehicle that is fast and agile but equally protective. Adding protection usually means adding weight and reducing speed. DARPA also wants to provide vehicle operators and crew with better situational awareness and that is where Honeywell comes in. Honeywell is also looking into camera and sensor technology that can provide an external view. In order to reduce the cost, the company is trying to minimize the number of cameras used in an array on the vehicle, Harris said. 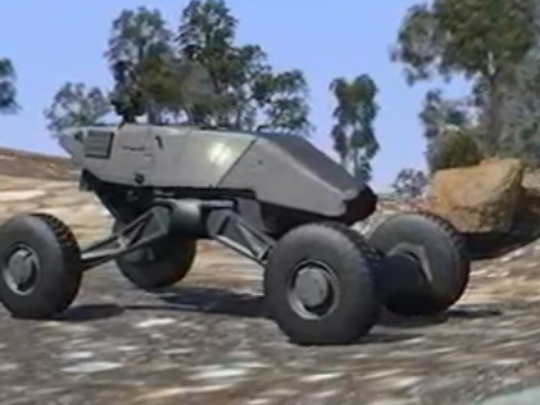 The company is using some of the lessons it learned from work on another DARPA program called the Sandblaster to get to a solution. Sandblaster attempted to tackle the degraded visual environment problem rotary-wing pilots have, especially when landing helicopters in dust. Honeywell is also working to increase how efficiently information is processed. It’s easy to add a server for more processing power except when that adds to the weight of a vehicle, which isn’t an option, Harris explained. Honeywell is not alone in developing 360-degree situational awareness systems to be worn inside a vehicle where visibility of the outside is limited. BAE Systems has a capability that allows soldiers wearing a helmet-mounted monocle to “see through” their armored vehicle. The company used its advanced jet fighter technology from the Eurofighter Typhoon helmet to develop the Battleview 360 system that consists of a monocle and touch-screen display. The monocle has the ability to see a video-feed — both visual and infrared — from the vehicle’s cameras and relevant symbology. Harris said the company is also researching and developing a solution "that we think is pretty unique and special" related to vestibulo-ocular reflex, which is the reflex eyes have to focus on things even while the head is moving around. The augmented and virtual reality windshield technology does call into question whether there would be a need for windows in future vehicles at all and Honeywell is looking at both possibilities. Harris said there are differing opinions on the matter. During NASA’s Project Mercury space program that started in the late 1950s, when the Mercury capsule was first designed, a window was not included and the astronauts essentially “revolted,” Harris described. The first phase of the program — for which Honeywell received $1.4 million — ends June 30, Harris said, and the company will deliver technology that will be demonstrated for DARPA and the military services. DARPA will decide whether to kick off phase two and fund Honeywell to develop technology further following that effort. The second phase would include a full demonstration at Yuma Proving Ground, Arizona, using a test vehicle, Harris noted.